Problem 1. Write down a chemical equation for the following statements and then balance it? Ferrous sulphate crystals on heating lose water and then decompose to form ferric oxide, sulphur dioxide and sulphur trioxide. (i) First of all count the number of all the reactants and products. (ii) As O has maximum no. of atoms, therefore start from it. To balance the no of O atoms on RHS & LHS multiply FeSO4 by 2, we get. (iv) The above equation can be more informative if physical states of the reactants and products are mentioned along with their chemical formula. Since the given example show decomposition reaction thus it require heat to happen, thus mention heat above the arrow, i.e. Problem 2. Identify the reactions which show displacement /double displacement reaction. 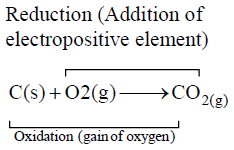 Option (ii) and (iv) show displacement reaction. Since in displacement reaction one element takes the place of another element and in option (ii) & (iv) we find same whereas option (i) and (iii) show double displacement reactions. In a double displacement reaction two compounds react by exchange of ions to form two new compounds and in reaction (i) & (ii) we find same. (iv) Mg acts as reducing agent as it accepts O provided by CuO. Problem 4. From the reactions given below. Which is a combination and which is a decomposition reaction? (i) In this reaction H2 and Cl2 gas react to form a single product HCl thus it is a combination reaction. (ii) In this reaction a single reactant ZnCO3 form ZnO and CO2. Thus this is a decomposition reaction. Problem 5. Give one example of each.